Chemex — Backyard Beans Coffee Co.
Clean and striking. 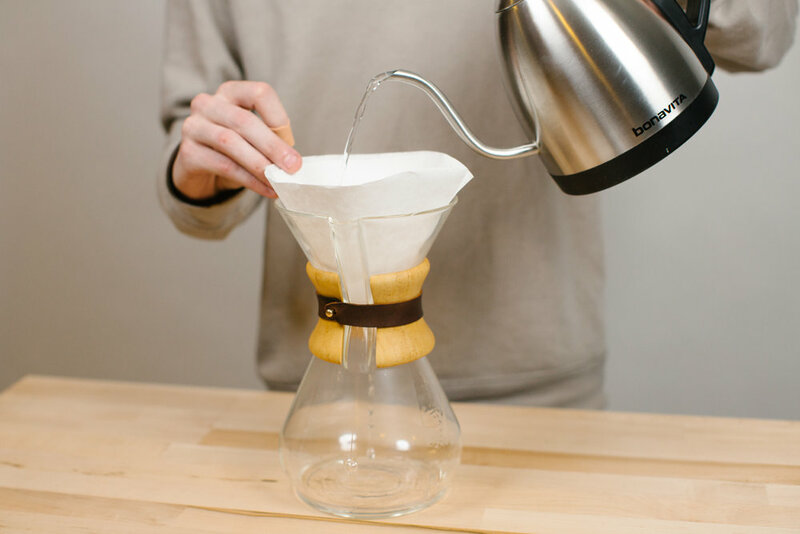 Form meets function beautifully in the Chemex. The Chemex delivers a rich, sweet, refined cup. 1.Get your water boiling first as you set everything else up. 2.Weigh out 50g of coffee. A level tablespoon of coffee is close to 6g, so 8 tablespoons should be about right. 3. Using a Chemex filter, place it in the chamber with the 3 folds against the spout. Rinse thoroughly with your hot water. 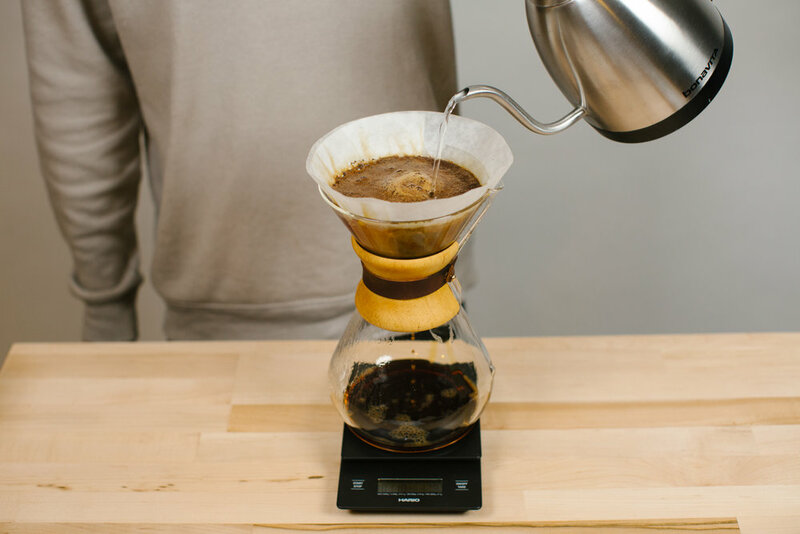 Chemex filters need to be flushed with water to help minimize any papery taste the filter may impart to the brew. 4. Dump this water out while leaving the filter in place. 5. Grind your beans medium/coarse. 6. Place the Chemex on top of the scale and tare the scale’s weight so it reads “0”. Add your ground coffee and tare the scale again. 7. After the water boils let it sit for 1-2 minutes before pouring, this will bring the temp down to where we want it, 195°F-205°F for brewing. 8. Start a timer. Pour 150g of water slowly to wet all the grounds, don’t bypass the coffee by pouring down the sides of the filter. Gently but thoroughly stir the coffee to ensure there are no dry pockets. 9. At 00:50 slowly pour to 800g, target to have all the water poured by 3 minutes. 10. As the brew begins to draw down, give the Chemex a little spin, or rock. This will cause all the coffee stuck to the walls to draw down with the water, making for a more even extraction = sweeter coffee. *If draw down takes much longer than 5mins try grinding coarser next time. If the grind size is uneven, with many large particles as well as a lot of “fines," this can also clog the brew.